An example of this move from inaction to action is the decision by diamond mining giant De Beers to restart exploration after a two year hiatus, caused by the unilateral imposition by the South African government of the third iteration of the Mining Charter in 2017, which wiped out more than R50 billion off the market capitalisation of South African mining companies. The new Minister of Mineral Resources, Gwede Mantashe, has by contrast consulted widely and promulgated the new Mining Charter in December 2018 and has promised an open door policy to addressing the challenges facing the mining industry. “Most, probably, of our decisions to do something positive, the full consequences of which will be drawn out over many days to come, can only be taken as the result of animal spirits – a spontaneous urge to action rather than inaction, and not as the outcome of a weighted average of quantitative benefits multiplied by quantitative probabilities,” the economist John Maynard Keynes wrote. Mantashe told the 14th Annual Southern African Coal Conference that he aims to raise the contribution of mining to the South African economy to 10 per cent within five years from the current 7 per cent. He pointed out that mining was the largest contributor to South Africa’s foreign exchange earnings with a 40 per cent share and within mining, the coal sector was the largest revenue generator outweighing the gold and platinum mining sectors. The South African coal industry mines 260 million tons annually of which some 73 million tons is exported and employs more than 86,000 miners who get R25 billion in salaries. Two of the reasons why Mantashe is bullish on increasing the share of mining are the Springbok Flats coal field which has coals seam 10 meters thick and the deepsea drilling for oil and gas off the South African coast. “I am going to an offshore drilling rig to see for myself what the prospects are. If the initial reports prove to be a reality then this could be a game changer for our country,” he added. 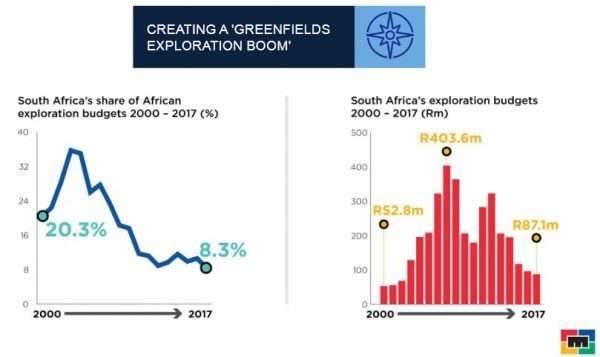 Garrett Soden, Africa Energy’s President and CEO, has said the Brulpadda-1AX exploration well is a world-class, basin-opening opportunity in one of the last under-explored regions offshore Africa. Block 11B/12B is located in the Outeniqua Basin approximately 175 kilometers off the southern coast of South Africa. The area has a proven petroleum system from the nearby Sable and Oryx oil fields. The Brulpadda (“Bull Frog”) Prospect has gross prospective resources of more than 500 million barrels with an upside potential of some 1.5 billion barrels. The Brulpadda-1AX exploration well is being drilled in 1,432 meters of water by the Odfjell Drilling-owned Deepsea Stavanger semi-submersible rig to a total depth of 3,420 meters subsea. The Minerals Council of South Africa, previously called the Chamber of Mines, surveyed its members towards the end of 2017 on what a more conducive regulatory environment would mean for fixed investment and job creation. 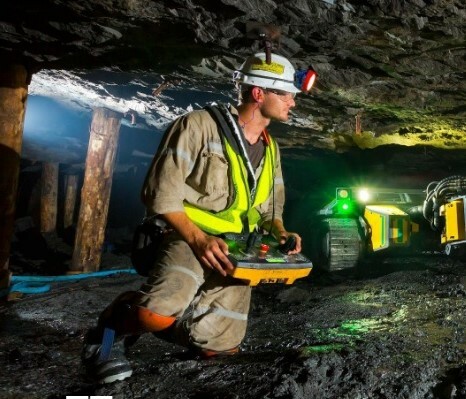 The result was that the estimated capital spending in the mining sector (stretching over the next four years) amounted to more than R145 billion, but a more certain and conducive environment (covering at least another three years) would unlock an additional R122 billion or an 84 per cent increase. Confidence in South Africa’s regulatory framework had all but vanished, so fixed investment in mining has been stagnant since 2009, while net investment has declined by 57 per cent since 2008 and it is has been outside investors such as India’s Vedanta that have invested in new projects such as Gamsberg. The key benefit to exploring multi-commodity mineral deposits such as the Gamsberg is that these activities will feed the increasing industrial demand created by accelerating technological innovation in batteries. This demand is reflected in the ongoing upward trend in the so-called “battery minerals” prices of copper, cobalt, lithium, nickel and zinc. This is anticipation of the electric vehicle (EV) revolution, which will have an impact on commodities form 2020 onwards, as that is when the mass market in EV will take off in China and the US, with Europe following in the subsequent years. Minerals Council South Africa Chief Executive Officer Roger Baxter said hope was in the air as there had been constructive engagement with government on a number of issues. He was addressing the media at the start of the 25th Investing in African Mining Indaba. “Hope is in the air and the green shoots are reflected in the fact that we believe the mining industry outperformed the national economy in 2018 with our estimates showing 1.2 per cent growth compared with 0.7 per cent for the national economy,” he said. He told The BRICS Post that South Africa currently has 1 per cent of global exploration spend, but it should be 5 per cent based on its resource base and he expected that to grow to 5 per cent within the next five to ten years. One of the beneficiaries of this renewed interest was Orion Minerals, which is resurrecting the old Prieska mine zinc copper in the Northern Cape. Its share price has risen by more than 30 per cent in the past month. Prieska was mined by AngloVaal for 20 years from 1971 to 1991 and produced some 1 million tonnes of zinc and 430,000 tonnes of copper from 46.8 million tonnes of sulphide ore milled. Below the worked-out area is a world-class orebody which is a top-30 global volcanogenic massive sulphide deposit with the probability of further reserves underlying this orebody. A 10-year, phase one project was outlined by the December 2018 scoping study and a bankable feasibility study is on track for completion in the second quarter, according to Orion. Phase one would exploit the deep sulphide ore body of 28.7 million tonnes, which has a grade of 3.8 per cent zinc and 1.2 per cent copper. This will produce a concentrate that will be trucked to a railhead 40 kilometres away which can access either the Coega deep water port or the Saldanha deep water port. There would be an estimated AUD130 million annual free cash flow after-tax at steady-state with a payback period of less than three years from first production. The upside potential is what has Orion says has it really excited as the company secured a large consolidated land package measuring 1,790 square kilometres in 2015. No major exploration activity on this land has taken place for past 30 years, but the application of modern exploration techniques presents a significant opportunity. In order to exploit this, Orion has a collaborative exploration agreement is in place with the Independence Group as the area is geologically similar to the Fraser Range in Western Australia. There are several nickel sulphide deposits that seem to be attractive, but exploration on these targets have been put on hold as management is focused on getting Prieska into production within the next three years. Core samples from exploratory drilling that I saw on a mine site visit showed nickel content as high as 4 per cent, but far more drilling has to be undertaken to verify the extent and grade of the resource.